Journal founded by Dr. Abraham Berliner Jan. 1, 1874. It appeared first as a bimonthly, in quarto form, under the title "Magazin für Jüdische Geschichte und Literatur," and contained a series of articles by Berliner on Hebrew manuscripts in the Italian libraries, besides studies in the history of Jewish culture, criticisms of new publications, extracts from midrashim, etc. Many of the most prominent Jewish scholars were contributors, and the success of the magazine justified Berliner in enlarging its scope. 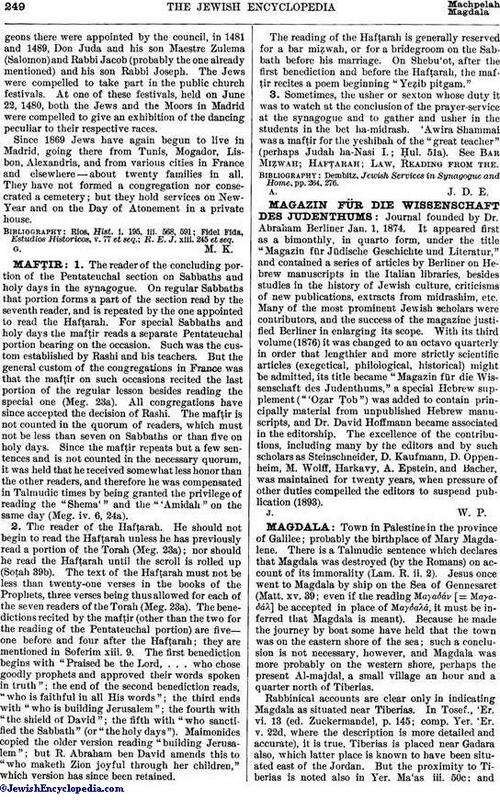 With its third volume (1876) it was changed to an octavo quarterly in order that lengthier and more strictly scientific articles (exegetical, philological, historical) might be admitted, its title became "Magazin für die Wissenschaft des Judenthums," a special Hebrew supplement ("'Oẓar Ṭob") was added to contain principally material from unpublished Hebrew manuscripts, and Dr. David Hoffmann became associated in the editorship. The excellence of the contributions, including many by the editors and by such scholars as Steinschneider, D. Kaufmann, D. Oppenheim, M. Wolff, Harkavy, A. Epstein, and Bacher, was maintained for twenty years, when pressure of other duties compelled the editors to suspend publication (1893).